Microsoft is launching Windows 10 as the new face of both Windows and eventually Windows Phone. At one point during Microsoft’s Tuesday press event, Terry Myerson, the executive vice president in charge of Microsoft’s OS group, called the new OS “our most open, collaborative OS project ever.” Collaborative, indeed. Microsoft is looking for user feedback, and what I demo'd on Tuesday may not be the same OS that customers receive next year. Microsoft executives didn’t even characterize the system as an alpha; they referred to it as a “build.” So with Windows 10 tentatively scheduled to be launched around the middle of 2015, there’s quite a bit of time to change, remove or add features before the system launches. The Windows 10 Start Menu fues Windows 7 icons and Windows 8 Live Tiles. That said, we can still point to various features that embody the new Windows 10 experience, and will almost certainly make the cut. These include the revamped Start menu; the new “task view,” virtual desktops and ALT-TAB features; windowed apps; and the new “snap assist” capability. Granted, I had a just a few moments to play around with each. But I quite liked what I saw, and if you sign up for the new Windows Insider program, you’ll have a chance to form your own impressions beginning on Wednesday. I’m not wholeheartedly in love with the new Start Menu. 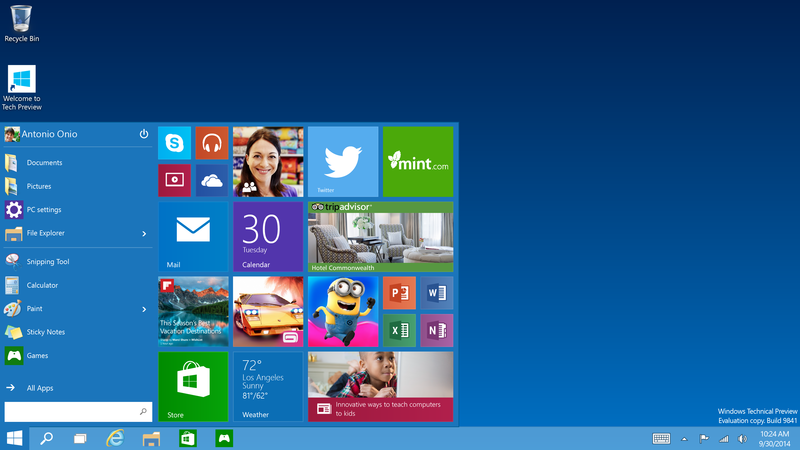 Aesthetically, it looks like someone surgically conjoined the Windows 7 and Windows 8 experience. Move past that inelegance, however, and it’s darn useful. On the left, there’s a list of frequently used apps, along with shortcuts to PC settings, as well as your documents and pictures folders. At the bottom, there’s a shortcut to launch an “all apps” view. On the right, the Live Tiles reproduce the functionality of the Windows 8 Start screen, with resizeable tiles that can dynamically show you how much unread mail is left. It appears that you should think of Live Tiles more like notifications rather than app shortcuts, although you can use them either way. Microsoft’s demo station had a large oversize tile showing the current calendar appointment, which seemed appropriate. If you want, you can resize the Start menu, increasing or decreasing its size and adjusting its position. Also, if you want to resize the Start menu itself, you’re free to do so. As some leaked videos foreshadowed, you can revert to the Windows 8 Start page, if you so choose. But that option wasn’t checked off, leading me to believe that most people would prefer the desktop experience. 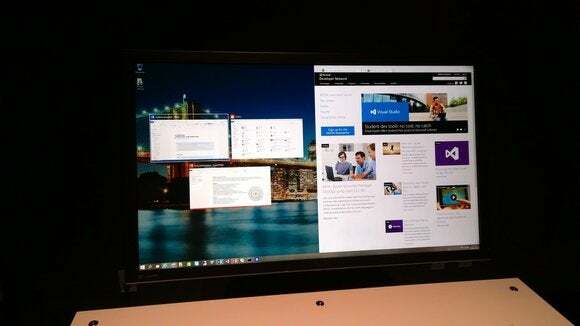 One of the Microsoft executives I talked to referred to the new “task view” as a “poor man’s multimonitor setup.” I can understand why. Virtually all Windows users use ALT-TAB to quickly shuffle between windows. It’s a great way to move from one task to the next. That capability is still available in Windows 10. What’s a virtual desktop? Think of it as a virtual display. If you’re running a multimonitor set-up, chances are you’re already allocating different applications to different screens: a browser window on one display, Outlook on another, and maybe a chat app on your docked notebook. 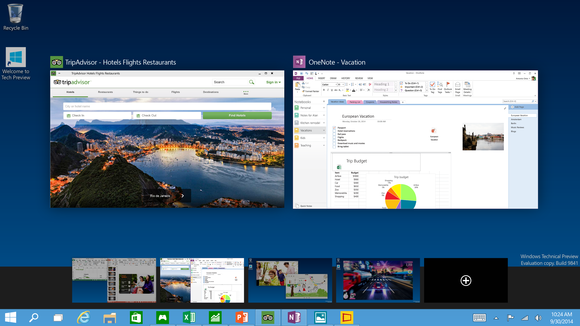 But with Windows 10, Microsoft allows you to snap more than one app to a screen. So if you choose, you could fill a secondary monitor with an Outlook pane and a PowerPoint file that you’re referencing in an email to the colleague. The Windows 10 taskbar includes the Windows button, which launches the Start menu, the new Task View button, and the Search button. 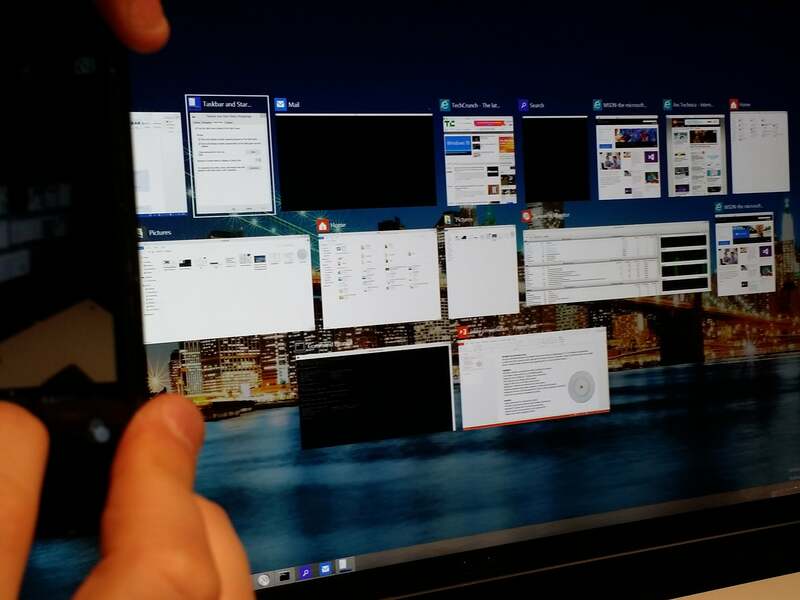 To the far right, the “underlined” apps show that they’re located inside a virtual desktop. But if you have one monitor, tapping the task view button—or more usefully, Windows+TAB—swaps between desktops, which are displayed on the bottom of the display. So if you have a “project screen” with PowerPoint, a browser window, and OneNote all contained within it, you can swap to an entirely different virtual desktop, or workspace, perhaps with Facebook and Xbox Music. You’ll also notice the apps themselves are shown above the desktops themselves, so if you can’t remember what virtual desktop actually owned that app, you can just jump into it regardless. There’s also a feature that may or may not make it to final release: On your taskbar, you’re probably used to instances of multiple browser windows stacked on one another. But in Windows 10, you may also see that app “underlined” by a horizontal bar, showing that it’s in a virtual desktop. The new task view shows you your virtual desktops, and the apps contained within them. For now, virtual desktops are a convenience, but they could also emerge as a security feature, allowing users to assign permissions to different ones. Microsoft officials wouldn’t tell me if they’ll be isolated from one another or “sandboxed” over time. And what about Snap, the nifty little feature that fills half of a Windows 8 screen? That’s been improved as well. Every app in Windows 10 can be dynamically resized in a window, although it remains to be see how well this works in practice. Snap a document to one side of the screen, and Snap Assist will suggest some others. In Windows 8, apps can be snapped by clicking the Windows key and the left or right arrow, snapping them to the left or right of the screen. That fills half the screen. With Windows 10, up to four apps can be snapped per screen, maximizing your productivity. What’s neat, though, is that once you snap an app, Windows 10 suggests another, similar app that you might want to snap next to it, from a small collection of windows. The feature is intended to save you the hassle of hunting about through menus to actually construct a virtual desktop. Time will tell whether these suggestions will prove useful, but it’s a good start. You can see, however, that a number of different features—Snap Assist, windowed apps, virtual desktops—all flow somewhat organically into one another. I’m honestly interested to see what difference they make in my own daily workflow. Windows 10 also adds a search button to the taskbar, moving the other major functionality of the Windows 8 Start page to the desktop environment. If you’re like me, you really don’t click icons on the Start page any more (or use bookmarks when searching the Web). Instead, “searching” for recent apps or documents is often quicker. 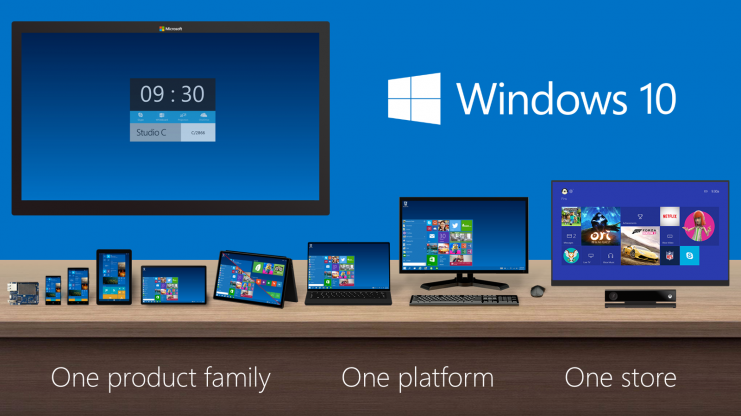 Microsoft promises consistent experiences over a variety of form factors and screen sizes. That approach is also found in Windows 10. Microsoft officials say that Search and File Explorer now displays your recent files and frequently visited folders, making finding files you’ve worked on faster and easier. Granted, Microsoft’s Windows 10 demonstration was somewhat orchestrated to put its best face forward. But with potentially millions of eager Windows users prepared to bang away on it beginning Wednesday, any flaws will be quickly exposed. What’s refreshing is Microsoft is actually encouraging this, similar to the way in which “developers”—i.e., fans—were encouraged to take its latest Windows Phone builds for a spin. Love it or hate it? Microsoft wants to know. But I think you’ll quite like Windows 10.